Sometimes the best of intentions go awry. Trying to do the right thing, a boy climbed a tree to rescue a kitten and ended up needing to be rescued himself. Sometimes the best of intentions go awry. Such was the case of a boy who tried to do the right thing by climbing up into a tree to rescue a kitten. Unfortunately, he wound up needing to be rescued himself. 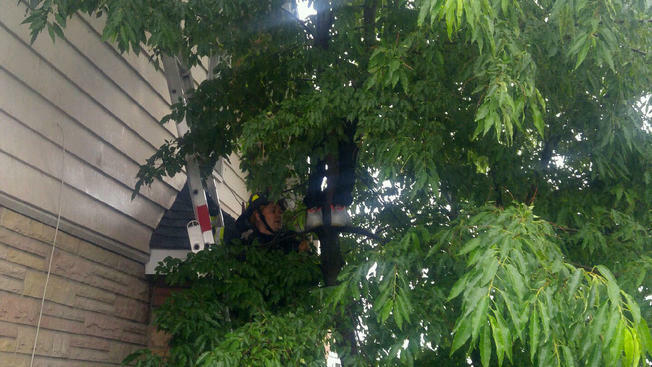 Hackensack Fire Lt. Jay Schlossareck shared with New York NBC 4, that a fire engine was dispatched and firefighters kept the boy calm while extending a portable ladder to conduct the rescue effort. The kitten was gently handed down first, then firefighters assisted the boy. The good news is both were safely extracted from the tree, but it is likely, at least for the boy, that will not be a venture soon repeated.